The Materials Technology Institute (MTI) scholarship was created to encourage outstanding students to pursue careers in Materials Engineering in the Process Industries. Each year, The NACE Foundation will award up to two (2) scholarships, in the amount of $5,000, on behalf of MTI. Candidate selection will include consideration of demonstrated interest in pursuing a career in the Process Industries through enrollment in relevant programs (Materials Engineering, Materials Science, Corrosion Engineering, etc), academic achievement, work experience, personal and professional activities, letters of recommendation and relevant coursework (completed or scheduled). The Selection Committee will consist of up to five (5) Materials Engineering professionals representing MTI member companies and one member of the NACE Foundation Board of Directors. Applicants must be enrolled full-time in an undergraduate science and/or engineering program at an accredited college or university in North America, Europe, or Asia. Applicants must demonstrate an interest in pursuing a career in the area of materials engineering in the process industries. For this purpose, Materials Engineering includes evaluation and selection of metallic, non-metallic and polymeric materials, corrosion control, optimal design, mechanical integrity, fitness-for-service, life cycle evaluation, and economic factors affecting performance of process equipment. Chemical Processing Industries broadly include chemicals manufacturing, petroleum processing, pharmaceuticals manufacturing, paper manufacturing, and other related processing industries; or, industries such as materials producers and fabricators, which support the CPI. Supplemental Essay: In 500 words or less, describe why you should be the recipient of this scholarship. In addition to the information above, please be sure to review the General Scholarship Guidelines on the NACE website. Applicants must meet all Scholarship Eligibility Requirements and answer all required essay questions. Applications are processed through the NACE Foundation. Prepare all of the required documents and information above, then visit the NACE Website to submit. All required paperwork must be received no later than January 1. Winners are invited to attend the NACE Annual Conference to accept the award, and attend one of MTI’s worldwide TAC Meetings as an honored guest. Within one year of acceptance of this scholarship, the recipient must submit a letter report to MTI and the NACE Foundation describing how the funds were used and how they aided in the student's overall education. 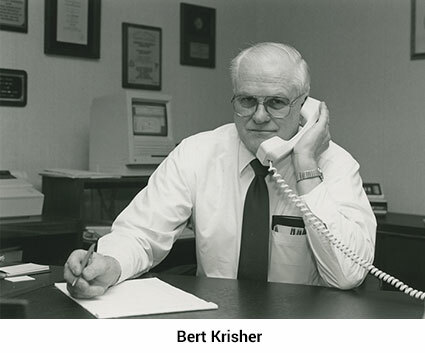 Albert "Bert" Krisher was an experienced materials engineer, who served MTI for 25 plus years. He was one of the gang of five who hatched the MTI idea in Toronto in 1976. He became the Monsanto TAC Rep in 1977 and served until his retirement in 1985 from Monsanto. Immediately after retirement, he became the Technical Director of MTI and served in that position until 1988 when he became Executive Director. He later stepped down from the ED role and became an Associate Director for the organization. In 2001, he became a Consulting Director. Bert passed away in 2008, but his MTI legacy lives on through the Bert Krisher Memorial Scholarship.